Most people with diabetes do not suffer from depression but several studies have shown that people with diabetes have a greater risk of depression than people without diabetes. The relationship between diabetes and depression isn't fully understood. 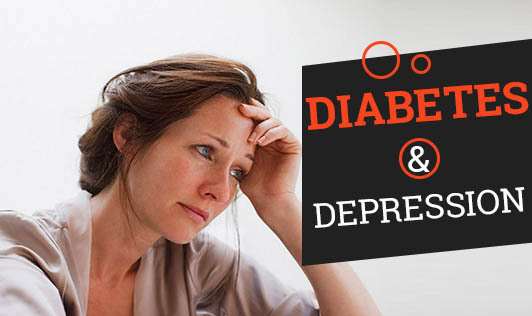 The rigidity of managing diabetes can be quite stressful and may lead to symptoms of depression. You may feel alone and excluded from friends and family because of all the extra work. Facing diabetic complications such as nerve damage, or if you're having trouble keeping your blood sugar levels normal, may make you feel like you're losing control of your diabetes. Depression may develop due to stress but also may result from the metabolic effects of diabetes on the brain. If you are depressed, chances are that you may find tasks such as regular blood testing too much, and it will also be hard for you to keep up with a good diet or you may not feel like eating at all which can affect your blood sugar levels. If you do experience such symptom, talk to your doctor because there may be a physical cause for your depression. Poor management of diabetes can cause symptoms that look like depression. Having low blood sugar levels can lead to hunger and eating too much. Low blood sugar at night can disturb your sleep and if you have high blood sugar at night you may wake up often to urinate and end up feeling tired during the day. Please contact your doctor and don't neglect these symptoms!